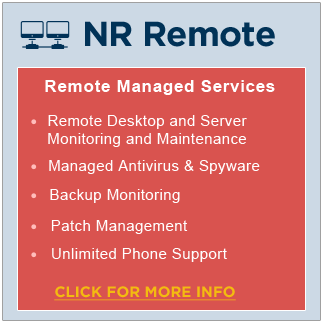 Network Resource has two fixed fee service plans: NR REMOTE and NR COMPLETE. These are well suited for networks ranging in size from 5 to approximately 200 computers. Rates are based on the number of servers and workstations. Our utilization of remote access technologies enables us to provide unlimited support at a much lower price than our competitors. With these plans, our clients can spend more time on improving their core business and less time worrying about their technology. By taking a team oriented approach, leveraging technology, and working closely with our customers - Network Resource can help produce results that give them the edge they need in today's increasingly competitive market. 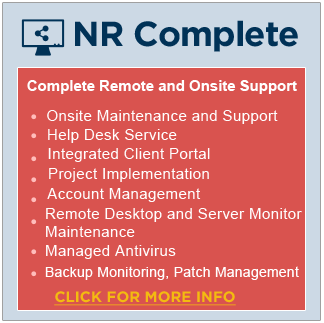 To learn more about what Network Resource can do for you, explore our service suite below or contact us and someone will be more than happy to discuss your needs. ©2017 Network Resource. All rights reserved.